Does the claim have any merit? about whether Mr. Spooner has a tenable defamation claim. Josh is wary about Mr. Spooner’s chances, especially because he claims, for purposes of the lawsuit, to be a private figure. 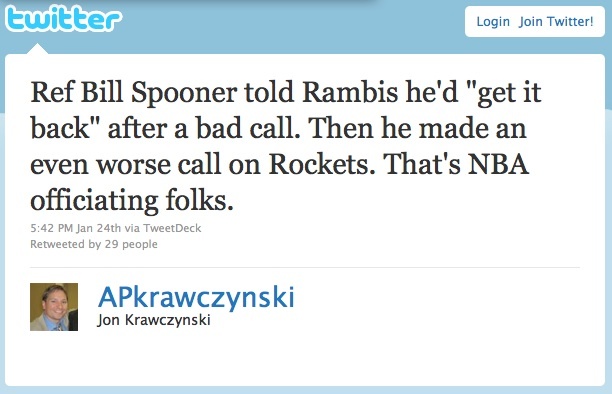 Yet, Mr. Spooner compares this allegation of game-fixing to the one involving former NBA referee, Tim Donaghy. That’s the same Tim Donaghy whose story was plastered on the front page of nearly every Sports section for months. Win or lose, this case serves as a reminder that tweets can lead to lawsuits. This especially holds true for employers and employees. Let’s put aside defamation for a moment. Not every negative statement online is a defamatory statement and employees have the right to engage in protected concerted activities to discuss working conditions like hours and wages. However, I can imagine a situation in which an online post would get an employee fired and sued. Suppose an employee posted a compilation of proprietary company information on his Facebook page. That employee’s Facebook friends subsequently visit his page, view the trade secrets, and then republish them on their own Facebook pages. Then their friends do the same thing. And so on, and so forth. Before you know it, the trade secrets that the employer spent a lot of money to develop and keep out of the public domain are now out there for general consumption. Although misappropriation of trade secrets claims generally don’t surface until after an employee quits and then seeks to utilize company trade secrets post-separation, if a current employee posts proprietary company information online, then the employee will likely find himself out of a job and in the courtroom, because he has placed his employer at a competitive disadvantage. Employers need to educate their employees about social networking. Implement a social networking policy with not just rules, but also guidelines to help foster responsible online behavior. That policy should begin by explaining what social networking is. Don’t assume anything. I gave a speech last week on social media and hiring where several attendees were unfamiliar with both Facebook and Twitter. Pair the policy with employee training on the policy, and the odds of a lawsuit should decline.